After the 1885 season the two major-league pennant winners, the Chicago White Stockings of the National League and the St. Louis Browns of the American Association, had played a postseason series to showcase their champions. As incentive for the players, the club owners, Albert Spalding of Chicago and Chris Von der Ahe of St. Louis, put up $500 each, with the winning players to divide the prize. One game was played in Chicago and three in St. Louis (one a rancorous forfeit win for the visitors). The teams then headed to Cincinnati, Pittsburgh, and points east. The traveling games were not a pecuniary success (only around 500 fans showed up for the Pittsburgh game), and before the seventh game was played in Cincinnati, on October 24, 1885, the two teams announced an abrupt end to the series. Each team had won two completed games, one had ended in a tie, and there had been that five-inning forfeit. A wire-service report said the teams mutually agreed to throw out the forfeit and make one final contest decisive. The Browns won easily, 13–4, and were headlined (in Sporting Life, at least) as “The World Champions.”1 Spalding, however, quickly disavowed the Cincinnati agreement, the prize money was divided evenly by the teams,2 and the series has ever after been listed as a tie. In late September 1886, with the pennant races winding down and both teams headed for repeat pennants, Von der Ahe issued a formal challenge to Spalding and his club to a “World Championship series.” Spalding quickly accepted and added the proviso that the winning club would “receive the total gross gate receipts, including the grandstand receipts.”3 Von der Ahe agreed to this, and a seven-game “Winner Take All” series was arranged, starting with three games in Chicago, followed by three in St. Louis. If a seventh game was necessary to decide the outcome, it was to be held in a neutral city. The White Stockings won at home on Monday and Wednesday, the Browns taking the Tuesday game. When the series shifted to St. Louis, the home team won on Thursday and Friday, positioning the Browns to win the series with a victory in Game Six. The skies were cloudy, but the game time had been moved up to avoid the early-autumn darkness, and a full house of rabid rooters was on hand at Sportsman’s Park. 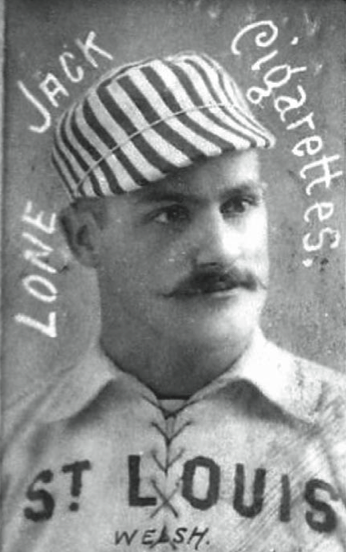 The starting pitchers were John Clarkson for Chicago, pitching his fourth game in six days, and Bob Caruthers for St. Louis, pitching for the third time in five days. 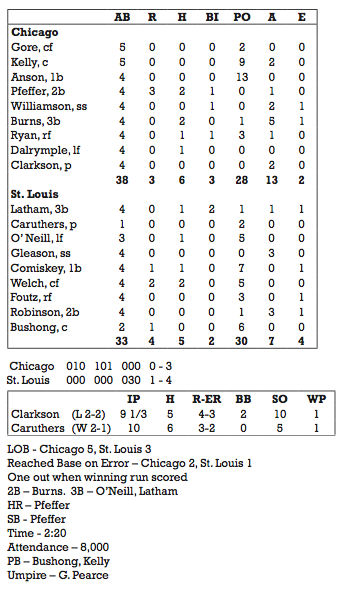 The game started out well enough for Chicago, as Clarkson held St. Louis hitless through the first six innings, while teammate Fred Pfeffer scored three runs. In the second inning Pfeffer started with a single, stole second, moved up on a passed ball, and scored on a two-out hit by Tommy Burns. In the fourth inning Pfeffer blasted a home run into the right-field seats. And in the sixth he raced all the way to third on a groundball that went through the second baseman’s legs and then rolled past the right fielder, then scored on a long fly out by Ned Williamson. Tip O’Neill got the Browns’ first hit, a rousing triple in the seventh inning, but spoiled it by overrunning third base and getting tagged out. But in the eighth, St. Louis finally broke through. Captain Charlie Comiskey opened with a clean hit and Curt Welch followed with a bunt that third baseman Burns threw wildly past first. Comiskey sprinted all the way home while Welch made second as the crowd erupted. The next two hitters flied out, but Welch took third on a short passed ball and Doc Bushong walked. Vociferous Arlie Latham was the next batter, and as Bushong edged off first Latham yelled, “Stay there, Doc, and I’ll bring you both in.” With two strikes against him, Latham whaled away at a low pitch from the tiring Clarkson, sending it soaring to deep left. Outfielder Abner Dalrymple started in on the ball, then watched it sail over his head for a triple, tying the score, 3–3. Dalrymple had a chance to redeem himself when he batted in the ninth with Burns on third and two out, but he struck out. O’Neill nearly won the game in the St. Louis ninth, but a leaping catch by Jimmy Ryan robbed him of a potential home run. Chicago was retired in order in its tenth. Welch led off the bottom of the tenth and was hit by a pitch. But Anson protested that he had made no effort to avoid the pitch, and the umpire made him bat again. On the next pitch Welch lined a single to center. A fumble by shortstop Williamson put two men on. Yank Robinson calmly bunted the men to second and third, bringing up Bushong. On the second ball pitched, catcher King Kelly signaled for a low ball outside. But Clarkson’s pitch sailed in high and inside, bouncing to the backstop. Welch ran home with the championship-winning run as Sportsman’s Park turned into a madhouse. Although the winning run has come down in history with the label “Curt Welch’s $15,000 Slide,” there is no contemporary evidence that he actually slid. In fact, the Missouri Republican said he “trotted home,”5 and the Globe-Democrat said that “Kelly made no effort to get (the ball), and … in a dazed manner stood and watched Welch come in.”6 As for the money, the Chicago News put the winnings at “exactly $13,781.95.”7 These discrepancies notwithstanding, the 1886 St. Louis Browns were world champions, the only American Association team with an undisputed claim to that title. 2. Anson, Adrian C. A Ball Player’s Career (Chicago: Era Publishing Co.), 1900. 3. The Sporting News, October 4, 1886. 4. Chicago Daily News, October 23, 1886. 5. Missouri Republican, October 24, 1886. 6. St. Louis Daily Globe-Democrat, October 24, 1886. 7. Article reprinted in St. Louis Globe-Democrat, October 26, 1886. 8. Missouri Republican, October 24, 1886.